In the event of a power failure or electrical outage to your home, your UV lamp in your UV system will lose power. This could leave your home unprotected if someone turns on a water faucet. Some bacteria and other waterborne pathogens can also swim past an un-powered UV lamp and reach the downstream portion of your water system and therefore not receive a dose of UV light once the power is restored. The same situation could occur in the event of a UV bulb failure (rare, but possible). 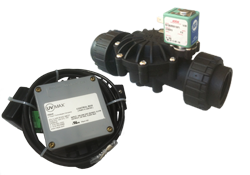 The solenoid emergency shut-off valve kit is installed at the outlet of your UVMax system and will physically close a valve in the event of a lamp burn-out, or power failure, thereby preventing any contaminant from passing through the system untreated. This feature will also turn off the water supply if there is a UV intensity loss (for models equipped with a UV intensity monitor). This kit is highly recommend for all homes with a known bacterial, virus, or cyst contamination problem, and for all homes with an electrical supply that is prone to frequent outages. 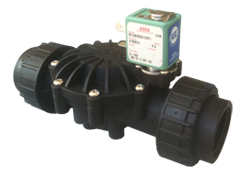 All kits include a wire harness and junction box (if required). 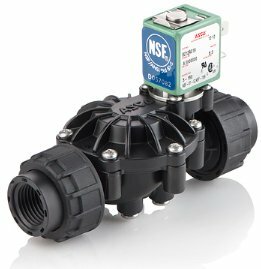 All valves are NSF/ANSI 372 validated for lead-free compliance, NSF/ANSI 42 and 61 for material safety requirements for drinking water treatment systems, and NSF/ANSI 169 for special purpose food equipment and devices.